Niantic Seal, Inc. is a distributor and fabricator of thermal interface materials including phase change, gap fillers and a wide assortment of heat sinks. 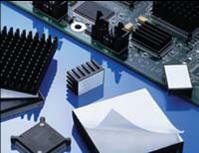 We provide high performance, high quality, and integrated thermal management solutions for electronic components. 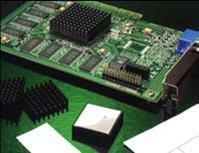 Niantic application engineers have designed thermal solutions into a broad spectrum of applications. 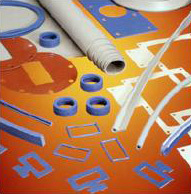 Chomerics manufactures a broad, innovative line of thermal interface materials. These products have been designed into thousands of applications and help guarantee the performance, integrity, reliability and durability of communications equipment around the world. Niantic is an authorized Chomerics fabricator. 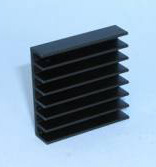 Aluminum Heat sinks are custom cut extrusions that absorb and dissipate heat from another object using thermal contact (either direct or radiant). Heatsinks are used in a wide range of applications wherever efficient heat dissipation is required for cooling electronic devices. JSM is a custom fabricator specializing in Quick turn rapid prototyping. Niantic Seal reinvests and continues to expand the fabrication department. In 2006, Niantic built an applications lab to better support customer needs. We understand the need to stay in step with current technology to provide high quality, tight tolerance products that are competitive in the global market. Parker Seal has designated Niantic Seal as a Sealing Technology Center distributor.